Excellent job, sir! Looking very nice and clean. Didn't know that, and now I do so DONE!!! Notice that one of the things that influences price of a currency the most is how much people use your currency as an alternative to holding gold. The same thing is true of other precious metals/wealth storage commodities, such as silver, etc. If we can weave these points into marketing/branding/press releases, etc., perhaps it can lead to people utilizing it for this purpose, thereby raising the value of Silkcoin. This will also, in turn, make Silkcoin far more difficult (damn impossible) to 51%, by making it cost far too much. In regards to technology. Why could it not be the most advanced? Are you talking single items of technology, or multiple integrations. Imo as open source grows so will integrative advancement of entire crypto community. The big problem is of course Trust. And community. And we got that. And its growing. In regards to future advancement of technology, I would assume to incorporate all the best open-source tech advancements integrated with creativity and skill.. and move forward into the up and coming mobile decentralized marketplaces..
Why could technological mastery not be achieved here? Time hasn't written this answer yet. And is moving quicker everyday. I imagine technology and trust. Are the two key items. Transparency and technology is a good mission. A technologically-advanced currency means very little to peoples' finances. is what makes a currency great and become adopted. Markety-peeps, can we roll that up into something bite-size? User-friendly, for consumers and merchants alike - UI, GUI, dentralized marketplace, app centre etc etc all tech based. So i would say in contrast, technology and its advancement has a direct effect on peoples finances involved in crypto. The two lists are a harmonious union. Sure thing. I will take all of these and write it into the proposed Mission Statements. There will be a few to choose from so hopefully there will be one that everyone likes and covers all of these excellent points. How about "an user-friendly digital currency whose future shape and direction of development is firmly in the hands of the community"? I think the wallet-embedded stake-weighted polling feature could be a prime selling point. Does any other altcoin have it? 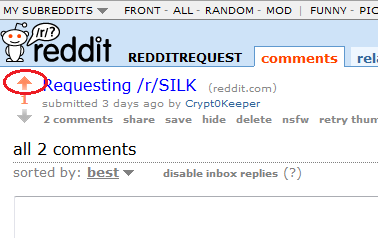 Any reply from mods about /r/Silk yet? If not, that means they never saw your post because the bot automatically removed it after detecting your don't meet requirements. Did you PM any of the mods directly?